It’s difficult to imagine anybody but the current cast of Channel 4’s hit comedy Derry Girls playing all of our favourite characters, but Clare Devlin as we know her may never have seen the light of day if it wasn’t for one tweet, according to the actor who plays her, Oranmore native Nicola Coughlan. And so Clare Devlin as we know her was born. A past student of NUI Galway, Nicola always had an interest in acting. “I knew I wanted to act, but I wanted to have a college experience too,” she says. “I probably spent more time with Dramsoc and the Musical Society than I did studying though. My friends and I would always go to Cuba and the GPO, which is probably showing my age because they’re not even around anymore!”, she jokes before asking if it’s Karma or Carbon that is now in place of the GPO on Eglinton Street. While studying in Galway, Nicola competed in ‘Acting Up,’ the National University Improvisation Competition where she was awarded the Outstanding Individual Performance Award, which she says gave her the confidence to pursue acting upon graduation. After graduating with a degree in English and Classics in 2008, she auditioned for the Oxford School of Drama, and despite her worries that she did the worst audition of her life, she was offered a place on their foundation course. It was then when the lull in opportunities occurred before ‘Jess and Joe Forever’. The Derry Girls script and Clare Devlin as a character were what drew Nicola to the series. The first series aired at the beginning of 2018 and was met with immediate praise, winning the award for best comedy at the IFTAs and Lisa McGee picking up the award for best writer in a comedy or soap. “Admittedly, I was a bit nervous about season two until I saw the script, but Lisa has so many stories to tell that there was no need to be nervous at all,” says Nicola. The final episode of season one reveals that Clare is in fact gay, something that Nicola was aware of throughout the filming process. The show also launched worldwide on Netflix before Christmas, and has found a strong fan base across the pond. At the time of interview, the first episode of the second season has aired, in which Clare and the rest of the girls are on a retreat to create ‘Friends Beyond the Barricade’ with a nearby boys’ Protestant school. Those who have watched the episode will remember Clare having to abseil on a cliff in one scene, which Nicola was terrified about. That episode launched to a consolidated viewership number of 3.2 million, making it Channel 4’s biggest audience for a comedy series since 2007. Beyond acting, Nicola has a strong presence on Twitter and is quite vocal about issues that she feels strongly about. Recently, she marched on Westminster with Siobhan McSweeney (Sister Michael) to highlight the issue of abortion in Northern Ireland. 26 other women joined them in delivering a 60,000-strong petition to Secretary of State Karen Bradley, symbolising the 28 women who travel from Northern Ireland to other parts of the UK for an abortion each week. 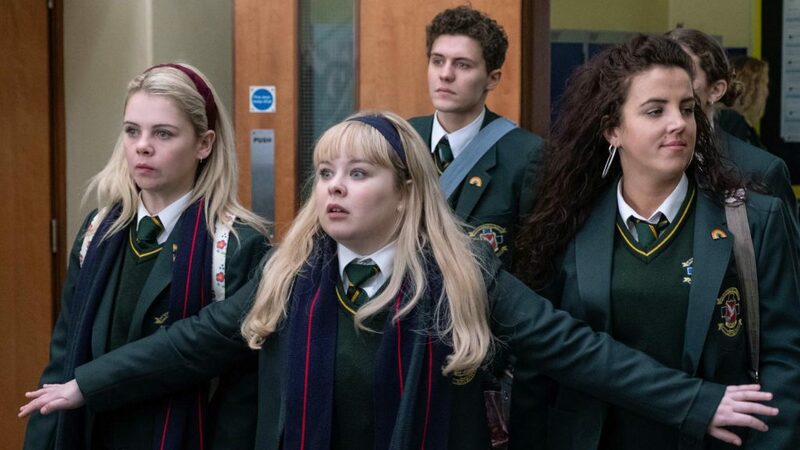 The penultimate episode of Derry Girls season two airs tonight, 2 April, at 9:15pm on Channel 4.